(L-R) Giuseppe Careddu - Director U.S.A & Canada, Alitalia; Steven Larkin - Director Sales Canada, Delta Air Lines; Nicola Bonacchi - VP Leisure Sales & International Markets, Alitalia; Benedetto Mencaroni Poiani - VP Regional Manager Americas, Alitalia; Jacqueline Palermo - Sales Coordinator Canada, Alitalia. For years, Alitalia has been plagued with headlines about bankruptcy and financial distress, but recent numbers paint an improving picture. Last year, the Rome-based airline saw a 7.1% increase in total passenger revenues and ranked as the second most punctual airline in Europe and the eighth-most punctual in the world. Alitalia started 2019 off on the right foot, marking its 15th consecutive month of passenger revenue growth in February, with 2.7% long-haul passenger traffic growth. January 2019 saw a 4% passenger revenue increase over the same month last year, with intercontinental passenger revenue increasing 6% and representing a 48% share of total passenger revenue. The airline highlights that that this growth was achieved without fleet expansion. Alitalia credits its improvement to three things: a new commercial policy more focused and responsive to travel agency needs; new marketing and rebranding initiatives that aim to change the public perception of the airline; and internal policies that created two new divisions, one focused on corporate sales, the other on leisure. 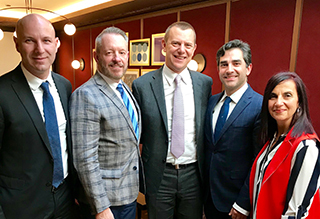 At a luncheon on 27MAR, Nicola Bonacchi, Vice President Leisure Sales & International Markets at Alitalia, said the airline is currently nearing the end of negotiations to be purchased by Ferrovie dello Stato Italiane, Italy’s national railway, and Delta Air Lines. He says he hopes a deal will be reached by the end of April. The positive traffic results come just as AZ resumes its nonstop service from YYZ to FCO on 31MAR, beginning with three weekly flights and adding frequencies until it flies daily from 2JUN to 28SEP. The route will be operated with an Airbus 330 aircraft with three classes of service: 20 Magnifica seats, 17 Premium Economy and 213 Economy. The luxurious 1-2-1-configured Magnifica Business class features a Salvatore Ferragamo amenity kit, Casa Alitalia lounge access and a lie-flat seats with a massage function – an amenity that passengers voted “Best Business-Class Seat Design” in U.S. magazine Global Traveler in 2018. The Magnifica class also has the option of selecting a “Honeymoon” seat for guests travelling with a friend or significant other. The panel between the two middle-row seats can be lowered to enjoy a more intimate flight with someone close. The Premium Economy long-haul option offers 40% more space than Economy class with a seat that reclines 120-degrees and a “dine any time” meal service where passengers can have their meal whenever they feel like it. No matter which class a passenger is flying in, Giuseppe Careddu, Alitalia’s Director U.S.A & Canada, stressed that the airline is hell-bent on changing the public perception about it being dated and destitute. From its revamped website to new digital campaigns, new crew uniforms and award-winning inflight cuisine, the airline wants to passengers to begin experiencing Italy right from time of booking. Over at AZ’s FCO HQ, the airport has made lemonade out of lemons after a severe 2015 fire devastated part of its international terminal. A completely revamped and reconstructed terminal now features a trendy shopping district and an Italian Food Street Area at Pier E, with 40 shops and 10 stores dedicated to food and beverage. Canadian passengers can use E-gate 36 for electronic passports, cutting time spent at passport control by up to 50%. With all these changes, the airport was voted 2018 Best Airport in Europe by Airport Council International.